Ohio | I'm not stalking you. I first discovered this word a year ago, but I have actually been doing it all my life. It is kind of like when I discovered the word shipper. All my life whenever I am near railroad tracks I hope that a train will come along so that I can watch it go by. It seldom happens. Unless you work for the railroad, you don’t have anyway to know when a train will arrive. I love to listen to the cars as they thunder by, their couplings creaking with each variance in the track. I was fortunate enough to live near railroad tracks for half my life. But it was not a busy track. This, my friends, is not a problem in Fostoria, Ohio. It is known as the Iron Triangle because so many trains (around 200 per day, I have been told) travel through the city. Fostoria has built a great rail park within the triangle where you can just sit and watch the trains go by. I was really impressed with the facility. There was a small roof for shade/rain protection, speakers that played the latest scanner communications, and a very well-kept bathroom. We must have seen about ten trains pass by in the few hours we were there. Here is a new video I uploaded on my YouTube channel of a Norfolk Southern double-header passing by. If steam engines (and possibly ones from the island of Sodor) are more your thing, watch this video of mine that already has over 2,900 views. And please like or subscribe or whatever it is people do over there on the ‘Tube. I am old. I can’t keep up with the young whippersnappers anymore. Posted in A day in the life and tagged Crossroads Village, engine, Fostoria, Iron Triangle, Norfolk Southern, Ohio, railfan, railpark, railroad, Thomas, train, video, watch. Bookmark the permalink. 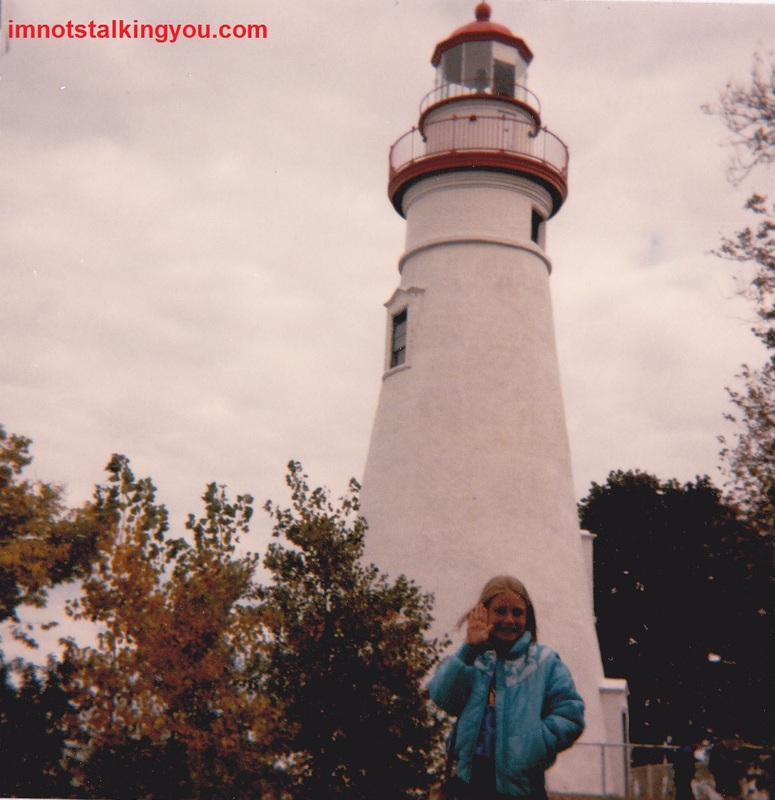 Me at Old Presque Isle Lighthouse, Presque Isle, Michigan. See how excited I am!? I had never given much thought to lighthouses. I had never seen one, and had no desire to. Then when I was eight my mom took us on a trip Up North (that is how people from southern Michigan refer to any point north of Grayling). Our destinations included Mackinaw City, Sault Ste. Marie, and Tahquamenon Falls. But we also were stopping anywhere along the way that caught our eye. We were heading north at a leisurely pace on US 23, which hugs the Lake Huron shoreline. We had just passed through Alpena (a town whose name still makes me giggle) and were headed up to Rogers City. (How nice. Roger has a whole city all to himself.) On the way, we saw an old, weather-beaten billboard alongside the road that boasted tours of a real lighthouse. We made the quick decision to check it out. We drove on a tiny winding road through the woods for what seemed like forever. Every turn did not bring us to a great lake or tall light, only more trees. It felt we were in an episode of Scooby Doo. I expected a green monster in ratty clothes to step out of the thick woods in front of us at any minute. Except we were not in a multi-color van, but a silver Chevrolet Chevette 2 door hatchback. If we had hit one of those monsters, it would have destroyed our tiny car. There were a few turns that were not well marked, but we must have gone the right way because we eventually came to a parking lot. Instead of yellow lines marking out the spaces, there were trees between the cars. You had to park just right, so that you could still get your doors open. The cool day must have warmed by that point, because I changed out of my jeans and into my shorts while we were still in the car. There were other cars there, but no people at the moment. My mom acted as a look-out. We were still under the dark cloak of the forest. But the sun could be seen to the south of us. We walked toward the light. We found ourselves in a big grassy clearing, with Lake Huron stretching out to the east. Between us and the great lake, lay a brick house painted white. Next to it, a white stone tower. That would be the first time I would ever lay eyes on a lighthouse. Inside there was an elderly man and woman who seemed to be running the show. They had a few souvenirs for purchase, and collected any money required to go up into the tower, details that I cannot remember. The man was also giving out rocks from the beach. He stamped them all so that they said “Old Presque Isle Lighthouse”. The rocks were free. I found him a little scary at the time. I grew up with very few males in my life. Even though he looked old and grizzled, he kindly showed me where my rock had a tiny fossil on the corner (If rocks can have corners). Then I went up in the tower. 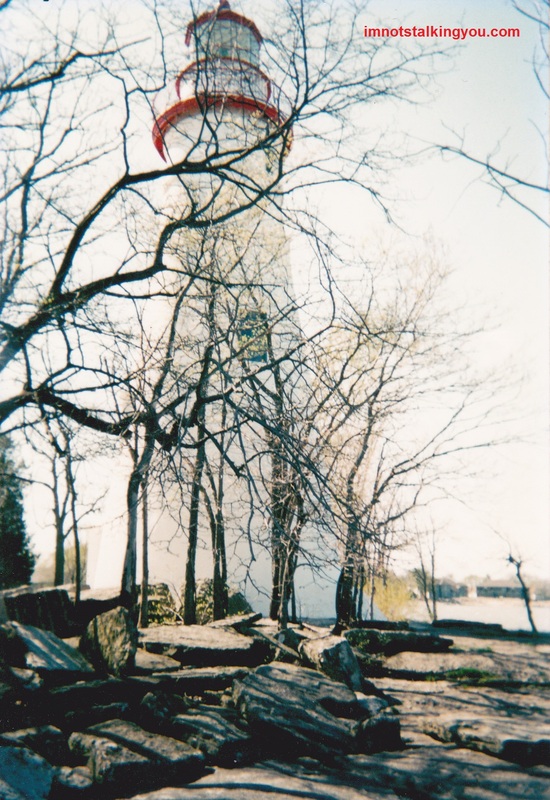 It was a relatively short lighthouse, standing only 30 feet tall, but one of the oldest surviving lighthouses on the Great Lakes. And it was plenty tall enough for the view to be impressive to an eight year old. 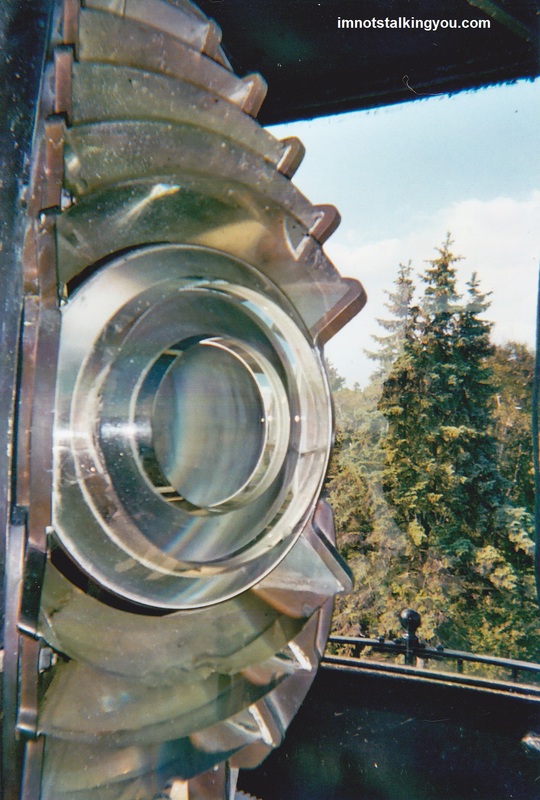 View in the Old Presque Isle Lighthouse, return visit 2003. While not a big fan of history, from that day on I was hooked on lighthouses. I wanted to see all of them that I could, but I also wanted to climb as many as I could. I didn’t even know at that time that I could do better than that. Only after we got back home, did we discover there was an even taller New Presque Isle Lighthouse just a mile down the road. Although I would take many more trips Up North, it would take me almost 20 years to get back and climb the 113 foot tower of New Presque Isle Lighthouse, tallest lighthouse on the Great Lakes that can be climbed by the public. In the years since, I found out that the elderly gentleman, George Parris died in 1991, and is said to haunt the Old Presque Isle lighthouse. I saw the story on a PBS special. It is kind of cool to have met someone who is now a ghost. 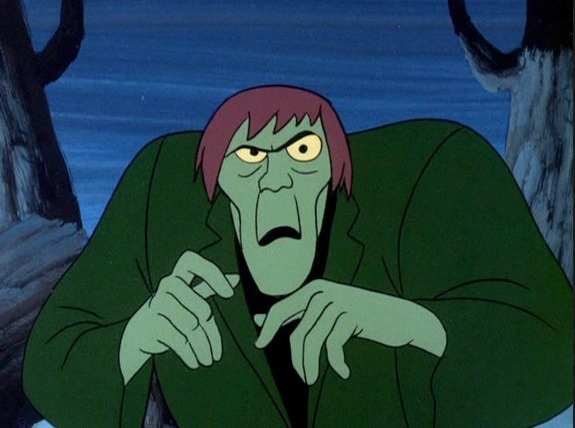 Maybe I was on to something with my earlier Scooby Doo analogy. Marblehead Lighthouse, Marblehead, Ohio. The most beautiful lighthouse I have ever laid eyes on. My mom and I also went with my grandma to Marblehead, Ohio to see the lighthouse there. Marblehead Lighthouse looks the most like the idyllic lighthouse you will ever see. When you are in a souvenir shop and see light switch covers or hand towels with a generic lighthouse on them, I guarantee you that they will bear some resemblance to Marblehead. It has very classic dimensions. It is a white tower, with green doors and a red roof and railing. It is is the oldest lighthouse in continuous operation on the U.S. side of the Great Lakes. 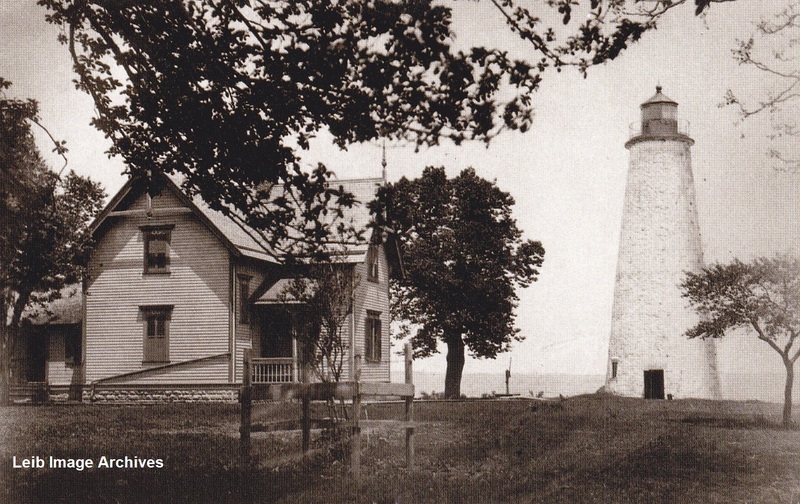 Photo of Marblehead Lighthouse from 1885. Later, they would add another 10 feet to its height. It was a very dreary day when we visited. The sky was the same gray as the sheets of marble that the lighthouse rests on. I enjoyed climbing on the uneven stone. It really frustrated me that the lighthouse was unmanned and locked up. I was like a reverse Rupunzel. I desperately wanted to get INSIDE the tower. But it would be years later before the State of Ohio would realize its full tourism potential and started offering visitors a chance to go inside of it. It turns out my lighthouse memories are very long-winded. 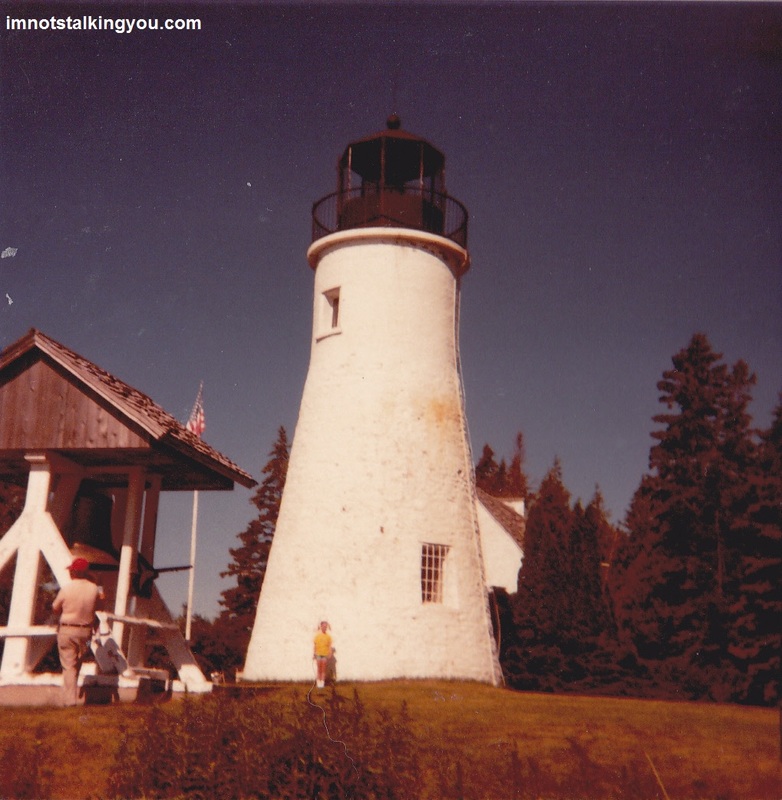 For more stories on the lights of the Great Lakes and a complete list of lighthouses that I have personally visited, come back by on Thursday. Posted in Childhood Reminiscing, UnProfessional Photography & Artwork and tagged Erie, George Parris, Great Lakes, Huron, light, lighthouse, Marblehead, Michigan, new, Ohio, old, photography, Presque Isle, range, Scooby-Doo. Bookmark the permalink.